Fantasia 2000 is a 1999 American animated anthology film produced by Walt Disney Feature Animation and released by Walt Disney Pictures. It is the 38th film in the Disney Animated Canon and the sequel to the 1940 film Fantasia. As with its predecessor the film consists of animated segments set to pieces of classical music, with The Sorcerer's Apprentice being the only segment that is featured in both films. The soundtrack was performed by the Chicago Symphony Orchestra with conductor James Levine. A group of celebrities introduce each segment in live-action scenes including Steve Martin, Itzhak Perlman, Bette Midler, Penn & Teller, James Earl Jones, Quincy Jones, and Angela Lansbury. Production began in 1990, and the film featured computer generated imagery, as well as hand-drawn backgrounds in certain sequences. Peter Schickele worked with Levine on the musical arrangement of each musical piece. Fantasia 2000 premiered at Carnegie Hall on December 17, 1999 as part of a five-city concert tour, with performances in London, Paris, Tokyo, and Pasadena, California. An exclusive release in IMAX theaters followed from January 1 to April 30, 2000, becoming the first animated feature-length film issued in the format. 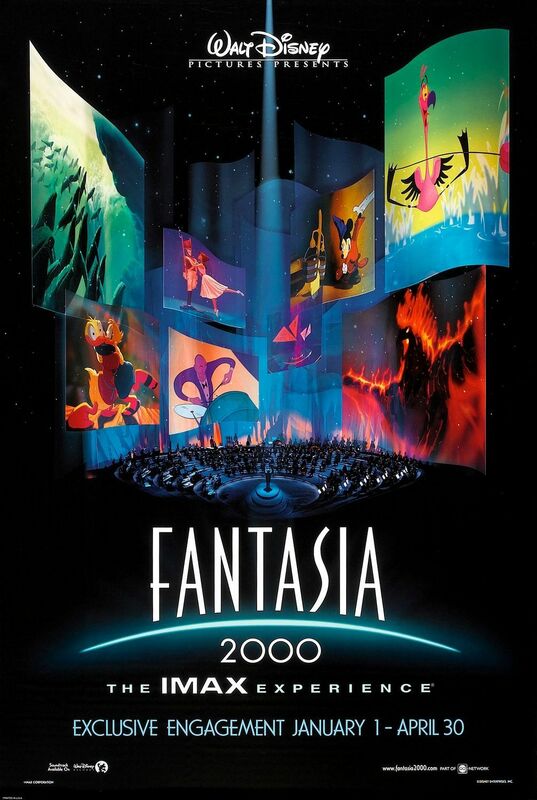 Fantasia 2000 was opened wide in the United States on June 16, 2000. Symphony No. 5, composed by Ludwig van Beethoven.note Normal compositions have the main opening repeat several times, i.e., be "free"; the Fantasia 2000 recordings only have it play once before proceeding to the finale Like Toccata and Fugue in D Minor, this is an "abstract" sequence, featuring butterfly-like triangles flitting about. Pines of Rome, composed by Ottorino Respighi. note This piece contains Movements 1, 3 and 4 (Villa Borghese, Janiculum, and the Appian Way; it omits Movement 2, the Catacombs, with Movement 1 going straight to 3 after it ends This one features a family of humpback whales that fly (yes, fly).note Introduced by Steve Martin and Itzhak Perlman. Rhapsody in Blue, composed by George Gershwin. In this sequence, several city people in 1930s New York go about their lives, set to the lively jazz-inspired music of Gershwin with visuals inspired by the drawings of Al Hirschfeld.note Introduced by Quincy Jones. Piano Concerto No. 2 in F Major (first movement), composed by Dmitri Shostakovich. Basically, this one is Hans Christian Andersen's The Steadfast Tin Soldier set to music, and it would be the last time Disney adapted one of Andersen's works until Frozen 13 years later. Piano Concerto No. 2 in F Major is also the first and only piece of music in this film composed after the original Fantasia's original theatrical release.note Introduced by Bette Midler. The Carnival of the Animals, Finale composed by Camille Saint-Saëns. This one centers on a flamingo playing with a yo-yo, much to the disapproval of his peers.note Introduced by James Earl Jones. The Sorcerer's Apprentice,note The actual movie uses the original recording from the first film, but the CD soundtrack has a recording by the Chicago Symphony Orchestra instead. back by popular demand.note Introduced by Penn & Teller. Pomp and Circumstance, composed by Edward Elgar. This scene is based on the story of Noah's Ark, featuring Donald Duck as Noah's assistant.note Introduced by Leopold Stokowsky, Mickey Mouse (Walt Disney/Wayne Allwine), and James Levine. Firebird Suite, composed by Igor Stravinsky. A sprite brings spring to a forest, only to accidentally awaken the destructive Firebird.note Introduced by Angela Lansbury. Adaptational Alternate Ending: In the original Hans Christian Andersen story The Steadfast Tin Soldier, both the Tin Soldier and the Ballerina he loves die in a fireplace. In the adaptation for Fantasia 2000, they both live. The main reason for this change in the Disney adaptation is because the writers of the film actually did not want to cause any Soundtrack Dissonance considering the fact that the musical piece accompanying this scene is an optimistic-sounding one. Adult Fear: In "Rhapsody in Blue", the little girl pulls away from her nanny and runs into a busy street. All the Other Reindeer: The other soldiers don't like the one-legged Tin Soldier because his disability makes him clumsy. Alone Among the Couples: Donald and Daisy both during the Noah's Arc sequence. As each believes the other drowned in the flood, the two mourn their loss while staring longingly at all the other animal couples on the boat (all while narrowly missing seeing each other). Animated Actors: In one of the commentaries of Fantasia 2000, Mickey Mouse commentates with Roy Disney on Sorcerer's Apprentice; apparently it took over forty takes to dance down the stairs and they had to borrow brooms from Warner Bros. in addition to bringing in the whole union. During Pomp and Circumstance, Donald Duck comes in near the end asking where the song they promised him for working with all those animals is, which results in the commentary room flooding. "Does anyone remember where we parked the ark?" Animate Inanimate Object: The toys in The Steadfast Tin Soldier. Artistic License  Geology: The eruption of the Volcano in Firebird Suite shows large lava flows emanating from the volcano, destroying pretty much everything in its path. After the eruption, however, the landscape shows no sign of lava flows (there would be large swaths of cooled lava covering everything), and instead shows the signs of a sudden, violent blast from the volcano that knocks over everything near it, simultaneously covering it with ash. The aftermath of the eruption, along with the mountain's new appearance, are directly based on Mt. St. Helens, which was exactly that type of eruption. The creeping lava is just Rule of Cool. Babies Make Everything Better: The baby whale in the Pines of Rome sequence. D'awwww. Bald of Evil: The jack-in-the-box in The Steadfast Tin Soldier is actually bald, which the ballerina finds quite amusing. Bible Times: "Pomp and Circumstance" is a retelling of the Noah's Ark story. Birds of a Feather: The Tin Soldier initially thinks that he and the Ballerina could be this because he first sees her balanced on one foot, with her other leg hidden by her skirt. He's crestfallen when she stands up straight, but she accepts his flower and flirts with him anyway. Black Comedy: "Pomp and Circumstance" has a unicorn, dragon, and gryphon(?) sitting aside and laughing at the idea that God will flood the Earth while the other animals are boarding the ark. Guess what happens to them. Break the Cutie: The sprite. She gets better, though. Brick Joke: Overlaps with The Stinger, as after the credits, Steve Martin is still waiting for the camera to come back to him. Call of the Wild Blue Yonder: In the "Rhapsody in Blue" segment, the main characters watch two skaters and imagine themselves living out their dreams; for the Henpecked Husband John, that means flying like a bird. Conspicuous CG: The Symphony No. 5 is the most obvious offender, but the Pines of Rome has several long shots that are incongruous to the close-ups. Granted, the Pines of Rome animatics actually were started several years before the film was released. Continuity Nod: Besides the actual discussion on the first film, 2000 begins with a speech on the "types of music" that is taken straight from the first film. The ending of the first film, with its Mood Whiplash, Dark Is Evil/Light Is Good structure set up between Night on Bald Mountain and Ave Maria, is mirrored in the ending for 2000, where the horror and evil of the Firebird is contrasted within one song by the sprite and her glorious restoration of spring. Eric Goldberg was one of the four main artistic directors on 2000 and animated the flamingos and Rhapsody in Blue. That's him drawing at the light table, and handing James Earl Jones the sheet of paper. A posthumous, animated creator cameo is done with George Gershwin in the Rhapsody in Blue segment. Gershwin is the man playing the piano, upstairs from the little girl's piano lesson. Damsel in Distress: The Ballerina in the "Steadfast Tin Soldier" does get in one good shot with a rubber ball when the Jack-in-the-Box attacks, but there's otherwise not a lot she can do to defend herself, especially not once she's trapped under a drinking glass. Dirty Cop: A brief but rather funny example in Rhapsody in Blue. Jobless Joe picks up an apple that seems to have fallen from a fruit stand, and heavily considers eating it himself (being broke and starving), but ultimately chooses to leave it. Just as he's about to put it back, a policeman arrives and calls him out for stealing... and then proceeds to eat the apple himself once Jobless Joe is gone. Disney Death: One of the little butterfly...things in the "5th Symphony" video has its wing broken while trying to protect its baby from a swarm of evil bat...things, and soon afterward gets swarmed, leading us to assume it died. In a blink-and-you-miss-it moment at the end, however, it turns out to be alive. Disneyfication: The adaptation of The Steadfast Tin Soldier, though that was mostly from the original ending not matching the music. Check out the storyboard reel on the DVD for that. Disney Villain Death: The Steadfast Tin Soldier when the Jack-in-the-Box falls into the fire. Does This Remind You of Anything? : During the Firebird Suite, a noble-looking stag watches as his once-peaceful forest home burns to the ground. Easter Egg: If you've got time to kill, watch the Rhapsody in Blue sequence with your finger on the pause button, to see all the names hidden in the background elements. It's a Shout-Out to Al Hirschfeld, who hid the name of his daughter Nina in his drawings from time to time. Explosive Breeder: The horde of baby bunnies exiting the Ark. During "Pomp and Circumstance", we never get a clear view of Noah's face from the front. Also, most of the humans in Piano Concerto No. 2 (or The Steadfast Tin Soldier, whatever title you prefer). Fertile Feet: The Spring Sprite in Firebird. More like fertile fingertips. And tears. Freeze-Frame Bonus: Mickey and Minnie are seen for a split second on the ark in Pomp and Circumstance. Grande Dame: John's wife in Rhapsody in Blue. The Great Depression: The implied setting for Rhapsody in Blue, or around that era at the least. Happy Harlequin Hat: The Jack-in-the-Box in The Steadfast Tin Soldier sequence has one. Henpecked Husband: John, the fourth main character in Rhapsody in Blue. Hero Stole My Bike: In Rhapsody in Blue, since every taxi passes right by, Duke grabs a kid's scooter and immediately charges off on it, though at least he had the decency to give him some money. Imagine Spot: The skating rink scene in Rhapsody in Blue, where all the characters imagine what their fantasies would be. Jump Scare: The chord when the Firebird first opens its eyes. Lighter and Softer: 2000 has each musical segment introduced by a celebrity guest, and most of the introductions take a somewhat comedic tone, which when contrasted with Deems Taylor's narration of the original causes 2000 to come across as less adult-oriented. Lonely Rich Kid: Rachel (the little girl) in Rhapsody in Blue. Unlike most Lonely Rich Kids, though, what she longs for is not friends her own age, but to spend quality time with her hard-working parents. The Marvelous Deer: In the Firebird Suite, it's an elk that awakens the nature spirit and encourages her when she despairs after the eruption. Missed Him by That Much: In "Pomp and Circumstance", Donald goes out looking for Daisy just as she comes in looking for him, and they subsequently spend the entire voyage of the Ark narrowly missing each other and each believing the other has drowned. Monochrome to Color: The "Firebird Suite" segment has the forest after the Firebird destroys it shot in dull ashen grey. The color returns once the Sprite restores it. To past Disney films and characters, especially "Pomp And Circumstance". The snake that's about to eat the mice towards the end of "Pomp and Circumstance" looks an awful lot like Kaa from The Jungle Book. And the elephants are Winifred and Hathi! The frilled lizards come from Frank in The Rescuers Down Under. The hippo that stomps on Donald's foot during the exit from the arc seems to have ditched her tutu since the last time we saw her. The shot over the bird's back revealing the ark mirrors the similar shot in The Lion King of Zazu revealing Pride Rock. The steadfast tin soldier facially resembles Woody from Toy Story. Nature Spirit: The sprite in Firebird Suite. Nice Job Breaking It, Hero! : The sprite in the Firebird Suite accidentally awakens the titular firebird, which almost kills her and the forest. "Noah's Story" Arc: There's a segment where Donald Duck is a deckhand on Noah's ark responsible for getting the animals onboard, including two non-anthropomorphic ducks. Non-Indicative Name: The animation for Pines of Rome is about as far from pines or Rome as it's possible to get. Violinist Itzhak Perlman lampshades this in his introduction to the sequence. Oh, Crap! : In the Firebird Suite, the sprite has a moment of horror when she accidentally awakens the Firebird and brings about the complete destruction of the forest. Painting the Frost on Windows: The nature spirit in Firebird brings the springtime. Pink Girl, Blue Boy: Inverted in Pomp and Circumstance, where Donald wears red clothing, while Daisy wears blue. As does Noah and his wife. Pursue the Dream Job: Duke, the construction worker in the Rhapsody in Blue sequence, eventually quits his job, during The Great Depression no less, to pursue his dream of being a jazz drummer. Rays from Heaven: At the beginning and the end of Pomp and Circumstance. Firebird is awfully similar to Studio Ghibli's green aesops. The DVD commentary by the animators did acknowledge Miyazaki as a source of inspiration. The appearance of the volcano at the end of "Firebird" is based on Mt. St. Helens. The whole concept of Donald and Daisy narrowly missing one another in "Pomp and Circumstance" was partially inspired by Sleepless in Seattle. The scene in "Pomp and Circumstance" when the multitude of bunnies exit the ark is a nod to the Silly Symphony "Noah's Ark". Much of the text that makes its way into the animated sequences are shoutouts to the creators. In the "Steadfast Tin Soldier" sequence, "Ernst's Fish" is a reference to producer Don Ernst. Rhapsody in Blue for a 12 minute number, is nearly Reference Overdosed. Sequence director Eric Goldberg's name pops up very often, noticeably on the plaque for the "Goldberg Hotel". The "Ninas" that Al Hirschfeld (the artist whose style inspired the look for the number) added in his drawings are present in the animation as well. Hirschfeld, his daughter Nina, his wife Susan, and writer Brooks Atkinson are among some of the people rushing out of the Goldberg Hotel. The original song's composer, George Gershwin, shows up in the sequence as himself, playing the piano one floor above Rachel during her piano lesson. The Sky Is an Ocean: The end of Pines of Rome is a literal example. Space Whale: Pines of Rome. Spiritual Successor: It's notable, considering Disney's track record for sequels, that 2000 truly has the same tone and feeling to it as the original 1940 Fantasia. Many of the shorts serve as Spiritual Successors to shorts from the original. Standard Snippet: Most of the music, although Rhapsody in Blue is stuck in this state, thanks to United Airlines commercials. Swiss Army Tears: The Spring Sprite sheds some. Take This Job and Shove It: At the end of Rhapsody in Blue, Duke is stuck between working as a builder or play the drums. He chooses to play the drums by throwing away his hat and kicking his drill off the building, where they eventually land on Jobless Joe. Trope 2000: Justified somewhat as it was released in the year 2000. At 12:00 midnight on the first day of the year, no less. Who Writes This Crap?! : James Earl Jones asks "Who wrote this?" after animator Eric Goldberg hands him a synopsis of the "Carnival of the Animals" segment. World-Healing Wave: The nature spirit in the Firebird suite gives a glorious example of this. World-Wrecking Wave: The firebird in the Firebird suite. You Dirty Rat! : The Steadfast Tin Soldier is menaced by frightening rats with glowing red eyes. You Shall Not Pass! : One of the triangle-butterfly-things pulls this in Symphony No. 5, fighting off some of the evil bat-things and getting injured so its smaller friend can escape. The ending reveals that it survived, though.